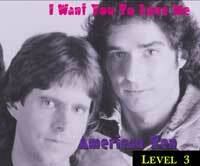 The first album's website, became the book for the LEVEL 1 stories. 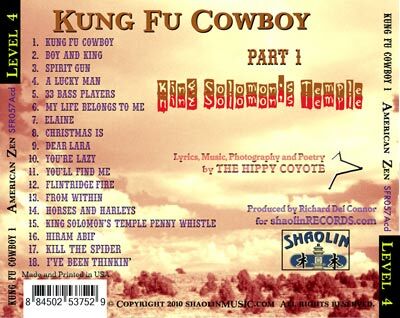 The second album's website, Christ Killer, copied the first album and became the book to tell the stories of Coyote's spiritual life. The third album's website had a slightly lighter touch...then eviction cut off website work. THIS FOURTH album's website, HAS A BOOK. 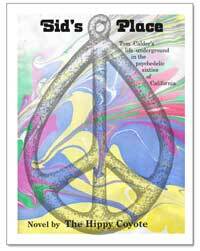 I finished writing the book on my 55th birthday, February 4, 2009. 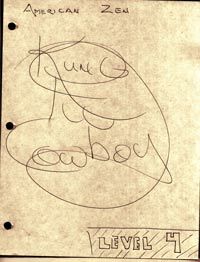 KUNG FU COWBOY ORIGINAL DRAFT. It was an extension of my "war board" where I map out each album in a bubble flow chart on my wall. This Kung Fu Cowboy NOTEBOOK became a book. It was cool. I rewrote a few poems and left most of it rough and natural. A handwritten book. You won't find many of those around. That's where I'm at now. Using the KUNG FU COWBOY ORIGINAL DRAFT, I now will create the album, LEVEL 4 = KUNG FU COWBOY album. 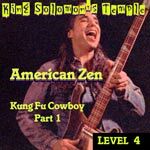 When the album is completed, I will typeset the KUNG FU COWBOY book in Quark XPress, then publish the book as a pdf download on the internet. You can print it or view it on your computer. Also, I will make l ots of links to other American Zen and Shaolin Records websites, so you can bounce around and find webpages you'd probably never discover on your own. Check it out! As of today, March 10, 2009, the ORIGINAL DRAFT book is all I've got to work with. I'm in an apartment now, in Montrose, California where I cannot play my drums. I recorded the drums in the CV Park Gymnasium this last summer. They sound excellent. I'm finishing the music. The FINAL DRAFT of this book will be sometime after that. Thanks for the compliments. People LIKE my handwriting. That's cool. Thanks. Wow. A lot's happened since my last update on this page. 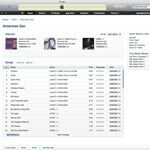 I finished the album and released it in 2010. Then... lots of bad stuff happened... divorce... family breakup... homeless... Las Vegas... San Diego... stagehand jobs... stung by a scorpion in the neck... So now I'm back on LEVEL 1. 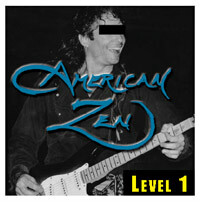 This website section of americanZEN.org is LEVEL 4 and it is what it was. I made it this far again in my life to LEVEL 4 of my Buddhist spirituality. In 1996 I made it to LEVEL 6. Oh well. Time to rise from the ashes and finish this LEVEL 4... but first I've got to regraduate LEVEL 1. 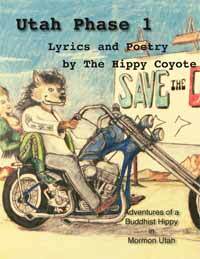 I'm living in my car, putting together the movie, KUNG FU COWBOY ROCK & ROLL MOVIE 1, with director Scott Karahadian. This movie will enable me to escape LEVEL 1 and rise to LEVEL 2 again. What religion will I graduate next?